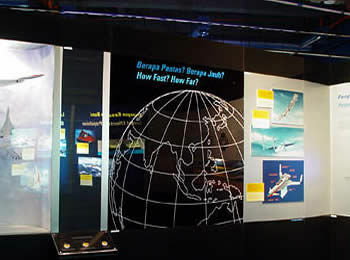 Kuala Lumpur's National Science Centre is also known as Pusat Sains Negara (PSN) in the official language of Malaysia. It was officially opened in the year 1996 by the then prime minister Dr. Mahathir Mohammad to increase public awareness, interest and understanding as well as appreciation of science and technology in the country. It is located at Bukit Kiara, north west of Kuala Lumpur city on eight hectares of land. This non formal ducational centre is run by the ministry of Science, Technology and Innovation. 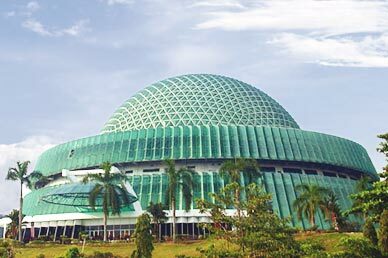 The Pusat Sains Negara is known for its distinctive architecture that has now turned it into a novel national landmark. Shaped as an aerodrome, it is four storied and similar to its cone topped by the geodesic dome. The PSN is made up of eleven galleries each with different themes that are further divided into two groups i.e. Basic Science and Technology. It deals with more than a thousand exhibits whose main objective is to inspire, encourage and excite visitors to have an interest in science and technology. Some of the more interesting topics featured in the different galleries include thinking machines, future world, pathways to discovery, and environmental odyssey. Anyone taking a trip to the National Science Centre always comes out more informed than when they entered. On arrival the freshwater aquarium with big fish is what you see first above your head, and then the simulation of the Malaysian rainforests under the Environmental Odyssey comes in second, with all the forest creatures along with the description of their habitats. The other themes displayed at their respective galleries include; knowledge about biology, physics, chemistry, and astronomy that comes under the Pathway to Science gallery. The Pathways to Discovery gallery displays the process of data collection, how to analyze it and the interpretation. Also on display here are tools used in the science and archaeological findings. The other gallery is the Childrens Educational Centre gallery that is meant to help the children better understand space science and the science of the universe using the planetarium, though there is the Planetarium Negara Malaysia that specifically handles space science and therefore more comprehensive and only geared towards the understanding of space science. The aquarium helps them understand the ocean along with other marine life by use of real life simulation of the exhibits. 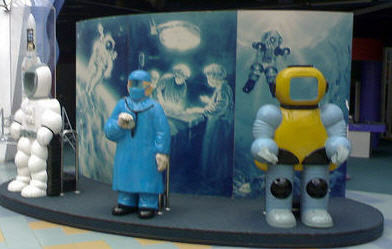 The Thinking Machines displays the way life has changed or been affected through the advancement in communication technology such as computers, robots, cellular phones and other wireless objects that have greatly improved the quality of life to mankind. The digital lifestyle offers another gallery for the visitor that goes on to explain and show how digital technology has changed our current life styles. The Gallery of Inventors Corner shows the impact made globally to the lives of people through different inventions and the current advancement in the same field. The Space Science gallery goes a step further; it has a 20m diameter dome screen that runs the space science show and sky movie, a much more practical and simplified technique of learning . The National Science Centre is equipped with an integrated Building Management System (IBMS) with two levels of exhibition floor that has an area of 6,717 square meters. It has a multi-media library, three workshops, two auditoriums as well as a multi-purpose hall that offers enough room for many other functions.